FIG Director Ms. Louise Friis-Hansen and President of the Danish Association of Chartered Surveyors (DdL) Torben Juulsager met a delegation from Ministry of Land and Resources of China (MLR) at the DDL and FIG premises. On 19 June 2017, FIG Director Ms. Louise Friis-Hansen and President of the Danish Association of Chartered Surveyors (DdL) Torben Juulsager met a delegation from Ministry of Land and Resources of China (MLR) at the DDL and FIG premises. Vice Minister Wang Guanghua was in the lead of the delegation that also consisted of Ma Yi, Director General, Office of the Chief Surpervisor of State Land, Yang Lu, Deputi Director, Department of cadastral Management, He Ping, Director General of Real Estate Registration Center, Shen Shengli, Division Direct of the Geenral Office and Fan Lic Division Directo of the Department of Science and Technology & International Cooperation. The delegation furthermore represented the Chinese Association Member of FIG China Land Science Society (CLSS).. This is the first face to face meeting between the two sides. During this meeting, FIG director Ms. Louise Friis-Hansen gave a presentation on FIG, to introduce FIG as a global member organisation as well as some of the contributions of FIG. Afterwards, DdL president Torben Juulsager gave an overview of cadastral management in Denmark, and the Danish cadastral system. 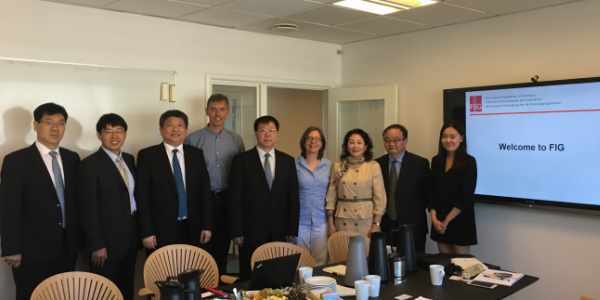 The purpose of this visit is to enhance mutual understanding between China and Denmark in the field of surveying and Cadsatral management, and consider more cooperate opportunities.